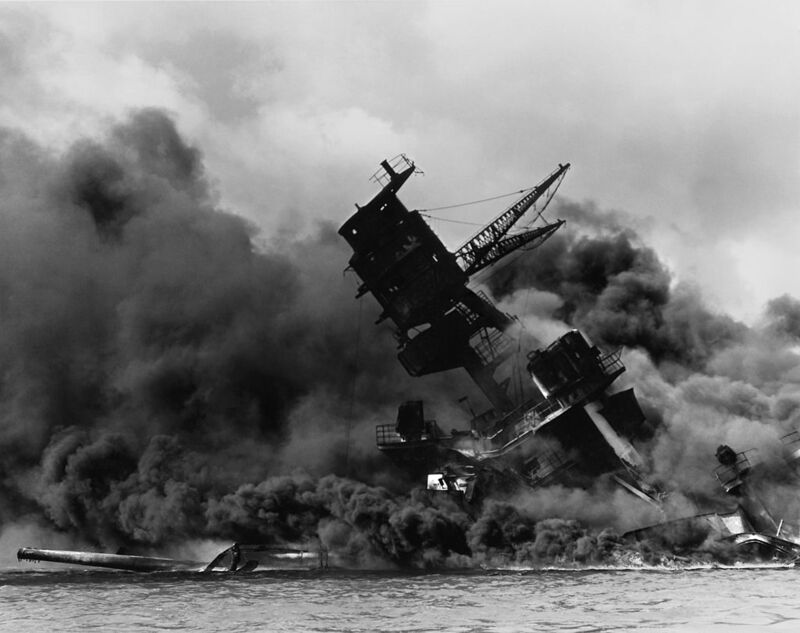 Today marks the 74th anniversary of the Pearl Harbor attacks, a day that Franklin D. Roosevelt declared would 'live in infamy'. The Japanese hoped that their attack would cripple the US Navy, but crucially the American aircraft carriers they hoped to destroy were not present. Below is an extract from Campaign 62: Pearl Habor 1941 by Carl Smith. Japanese first-wave attack aircraft descended on Ford Island and Hickam airfields. Torpedo bombers began their runs on Battleship Row. 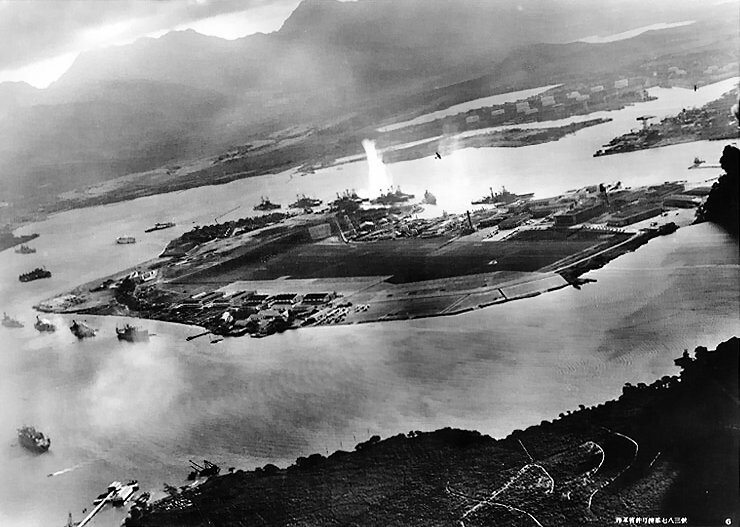 Pearl Harbor was under attack. 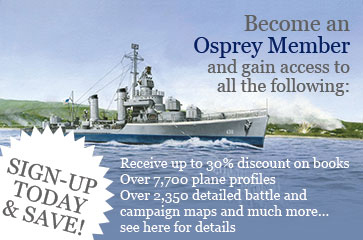 On this particular Sunday morning all was SOP – standard operating procedure – in the Pacific Fleet. Chapel services were planned, mess halls and galleys were laying out breakfast, launches to and from shore were readying, and men on duty rosters were preparing for their watch. Japanese aircraft swooped out of the morning sky, lining their sights on capital ships. At 0755 hrs, Lt. Cmdr Logan Ramsey stood at the window of Ford Island Command Center watching the color guard hoist the flag. A plane buzzed by and he snapped, “Get that fellow’s number!” Then he recalled, “I saw something … fall out of that plane …” An explosion from the hangar area cut his words short. Racing across the hallway, Ramsey ordered the radioman to send out the following message: “Air raid, Pearl Harbor. This is NO drill.” The message went out on the local frequencies at 0758 hrs. Ensign R. S. Brooks aboard West Virginia saw what he erroneously thought was a shipboard explosion on California. Reacting instantly, he ordered hands to turn to for an Away Fire and Rescue Party. Men boiled up from bunks to help. Lieutenant Matsumura recognized USS Utah, the former battleship now a training ship, on the northwest side of Ford, so he searched for alternate targets. Six planes from Lt. Nagai’s formation saw Utah and sped like arrows to drop their torpedoes at 0755 hrs. Utah and Raleigh reeled under torpedo explosions. Aboard Raleigh, confusion reigned. The torpedo knocked out electrical power just as a bugler sounded battle stations. Sailors immediately manned Raleigh’s 3-inch guns, which had ammo in ready boxes, while she began listing to port. South of Ford Island, 1010 Dock experienced a slashing attack. Nagai headed into the sun towards a battleship but realized after launch it was the paired Oglala and Helena. Nagai’s torpedo went under Oglala and the Helena shook as the torpedo bit into her starboard side. Oglala’s seams split from the concussion and took on water. At 0757 hrs, on Battle Ship Row, Lt. (JG) Goto flew to the left rear of Murata and straight at Oklahoma, released his torpedo and climbed. “It hit!” cried his observer as a huge jet of water geysered upward. Aboard the Vestal outboard of Arizona, CWO Hall saw the bombers, identified them as Japanese and sounded general quarters. Men poured from below decks and the mess area, and within ten minutes Vestal’s guns were firing on the invaders. About 0800 hrs, crewmen Huffman and de Jong on PT 23, a Higgins class 78-ton patrol torpedo boat, saw aircraft (identified as Japanese by the “meatball” Rising Sun insignia on their wings) swooping in and dropping bombs and torpedoes. They argued about what the aircraft were doing, awakening Ensign Ed Farley, who had been sleeping below deck after a late night on the town. Farley made his way to the deck, wiping sleep from his eyes and yawning. Following their gaze, he was horrified to see one plane fly over them on dead course for California: an instant later the battleship was rocked by an explosion. Huffman and de Jong jumped into a gun turret and fired on the attacking aircraft with twin .50 cal. machine guns. One attacking aircraft wobbled and then went down, possibly the first blood the American anti-aircraft fire had drawn. If you are interested in reading more about Pearl Harbour then take a look at Campaign 62: Pearl Harbour 1941 and Raid 26: Tora! Tora! Tora!.